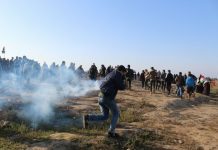 On Friday afternoon, 12 October 2018, using excessive force against the peaceful protesters in the eastern Gaza Strip for the 29th Friday in a row, Israeli forces Killed 7 Palestinian civilians, including a child, and and wounded 224 others, including 42 children, 3 women, 3 journalists, and a paramedic with live bullets and direct tear gas canisters. Ten of those wounded sustained serious wounds. Sixteen of theose wounded sustained serious wounds. According to PCHR fieldworkers’ observations, the border area witnessed heavy deployment of the Israeli forces this week as the latter heavily fired live bullets, increasing the number of causalities. According to PCHR fieldworkers’ observations, the border area witnessed heavy deployment of the Israeli forces this week as the latter heavily fired live bullets, increasing the number of causalities . The Israeli forces continued to use upon highest military and political echelons excessive force against the peaceful demonstrators who posed no threat or danger to the life of Israeli soldiers in the areas of demonstrations. Investigations and observations by PCHR’s fieldworkers emphasize that the demonstrations in all areas were as always fully peaceful, and neither weapons nor armed persons were seen. However, the Israeli forces’ snipers continued to position on the hills, behind the sand berms and in military jeeps along the border fence. At approximately 14:00, thousands of civilians, including women, children and entire families, started swarming to the 5 encampments established by the Supreme National Authority for the Great March of Return and Breaking Siege along the border fence, east of the Gaza Strip governorates. They raised flags and chanted national songs. Hundreds, including children and women, approached the border fence with Israel, set fire to tires and gathered 300 meters away from the main border fence. Some of them attempted to throw stones at the Israeli forces, pulled parts of the second barbed-wire few meters away from the fence established inside the Palestinian territories few meters away from the border fence and in limited cases, they threw Molotov Coctail along the border fence. Some of the protestors also attempted to cross the border fence, particularly in eastern al-Buraij refugee camp. However, there was no threat posed on the lives of Israeli soldiers stationed behind barracks and sand berms, 70 meters along the border fence. The Israeli shooting, which continued until 19:00, resulted in the killing of 7 civilians, including a child. Four of them were killed in eastern al-Buraij refugee camp, 2 were killed in eastern Gaza City and on in eastern Rafah. Ahmed Ibrahim Zaki al-Taweel (23), from Deir al-Balah, was hit with a live bulllet to the chest ineastern al-Buraij refugee camp. Mohammed Abdul Hafith Yusuf Isam’il (29), from Deir al-Balah, was hit with a live bullet to the chest in eastern al-Buraij refugee camp. Ahmed Ahmed Abullah Abu Na’im (17), from al-Nuseirat refugee camp, was hit with a live bullet to the chest and incised wound to the left arm in eastern al-Buraij refugee camp. Abdullah Barham Suleiman al-Daghmah (25), from ‘Abasan al-Jadidah in Khan Younis, was hit with a live bullet that peneterated the right side of the abdomen and exited the left side in eastern al-Buraji refugeec amp. Tamer Iyad Mahmoud Abu ‘Armanah (21) from Rafah, was hit with a live bullet to the head in eastern Rafah. ‘Afifi Mahmoud ‘Ata al-‘Afifi (18), from Gaza City, was hit with a live bullet to the abdomen in eastern al-Sheja’eiyah neighborhood. Mohammed ‘Essam Mohammed ‘Abbas (20), from Sheikh Redwan neighborhood was hit with a live bullet to the head and succumbed to his wounds he sustained in the evening in eastern al-Sheja’eiyah neighborhood. Moreover, 224 civilians, including 42 children, 3 women, 3 journalists and a paramedic, were hit with live bullets and direct tear gas canisters. Sixteen of theose wounded sustained serious wounds in addition dozens suffering tear gas inhalation and seizures after tear gas canisters were heavily fired by the Israeli soldiers from the military jeeps and riffles in the eastern Gaza Strip. PCHR hereby condemns the crimes committed by the Israeli forces, believing it is as a result of Israel’s enjoying impunity thanks to the U.S. and so encouraging the Israeli forces to commit further crimes upon an official decision by the highest military and political echelons. PCHR emphasizes that continuously inflicting casualties, either killed or wounded, is unjustified, and using lethal force to target and kill civilians, who exercise their right to peaceful assembly or while carrying out their humanitarian duty, is a serious violation of the rules of international law, international humanitarian law, the ICC Rome Statute and Fourth Geneva Convention. Thus, PCHR calls upon the ICC Prosecutor to open an official investigation in these crimes and to prosecute and hold accountable all those applying or involved in issuing orders within the Israeli Forces at the security and political echelons.